Who Will You Study With? The Etowah Valley is a bridge between Atlanta and the Appalachian South, where nature meets culture. At Reinhardt University’s Etowah Valley Master of Fine Arts (MFA) Program writers create a literature that is story-driven and grounded in the places where we live, whether rural or urban. Reinhardt is the only higher education institution in Georgia offering a low-residency MFA in Creative Writing. Our 60-hour low-residency MFA in Writing offers classes in poetry, fiction, creative-nonfiction/memoir, and scriptwriting (film, TV, and stage). Over the course of two years, each student works one-on-one with published writers in their genre. They also take cross-genre classes that teach the craft elements and several online courses with other students during the residency. 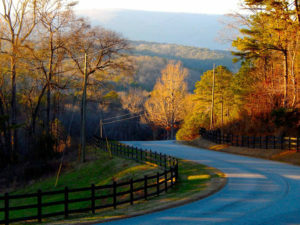 Each summer, students visit our beautiful campus in North Georgia for a 10-day intensive residency to be immerses in writing daily writing workshops, craft classes, experiential excursions into natural and urban environments, and nightly readings on campus from our visiting writers. A very important component is the one-on-one meetings with writing mentors to discuss in-depth each student's creative work. Our tree-lined campus is nestled in the shadow of Pine Log Mountain for the perfect writing experience. English and Language Arts teachers in Georgia middle and high schools can use Reinhardt University's MFA to upgrade to a Level 6 Specialist Degree for the purposes of promotion and salary increases. Teachers need to have been previously certified in either English or middle grades language arts or have passed the GACE in English or Language Arts before completion of the degree. The program is listed in the Georgia Professional Standards Commission Certificate Upgrade Advisor under Specialist Level 6 for English and middle grades Language Arts. Our students travel from all over the United States to attend the summer residency to learn from some of the finest writers. In doing so, they embody a unique mixture of cultural traditions and lifestyles. Amid the thriving Atlanta film scene and Southern environmentalism, we believe in the art of storytelling that develops voice and meaning to the individual artist.